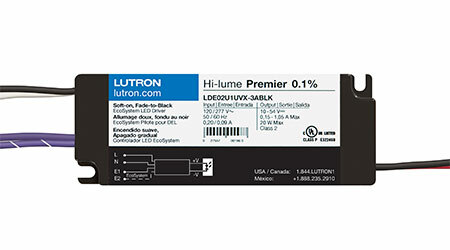 Hi-Lume Premier 0.1 percent architectural downlight driver with EcoSystem digital control provides smooth, continuous dimming down to 0.1 percent of full output power, and transitions gracefully between off and on, with Soft-on, Fade-to-Black. Ideal for projects that require downlights with a smaller aperture. In addition to small aperture downlights, works with smaller and lower-wattage linear and decorative luminaires. Compatible with all Lutron EcoSystem controls including HomeWorks QS, Quantum, GrafikEye Energi Savr Node, and PowPak. UL Class P Listed and NFC configurable, 5-20W range.